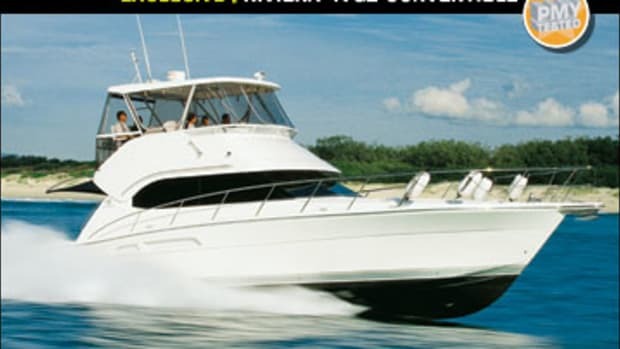 Riviera builds a boat that makes you forget about pods. Over the last few years I’ve tested quite a few boats that were equipped with pod drives. Some were more successful than others, but in every case I found it impossible not to focus on the pod system and how it dictated both the boat’s performance and accommodations. Whether they were IPS or Zeus, the pod drives not only dominated the boat, in some ways they actually defined it. I knew someday pods would become so ubiquitous and widely accepted that I would get on a boat equipped with them, examine, test, and evaluate the vessel, and then add, “Oh, and by the way, this boat also has pod drives.” At that point, I’d be able to declare that, at least for myself, pod drives had become just another accepted and ingrained onboard feature, like a chartplotter or a bow thruster, and I could again return to evaluating boats on their inherent features and performance. 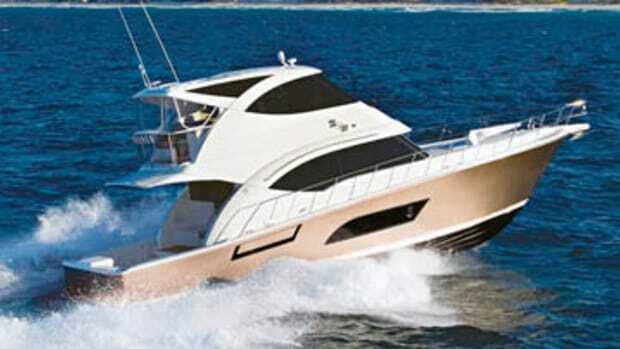 That day arrived for me in May when I ran Riviera’s new 43 Open Flybridge out of Sanctuary Cove, Australia. From the very moment that I approached her at the dock, I could see that she was different. 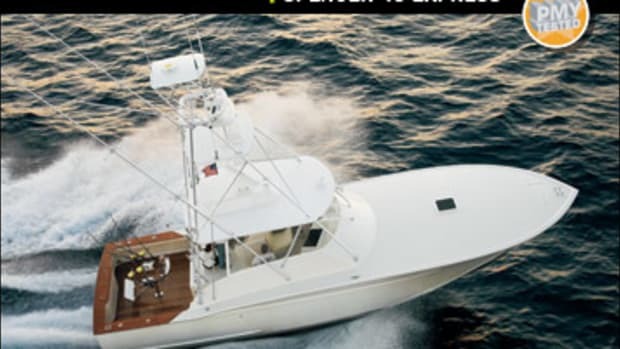 Riviera cut its teeth on building real convertibles, boats designed for fishing that could also be cruised—today it offers six open-bridge and five enclosed-bridge models ranging from a 38 open to a 70 enclosed. I’ve been on every one of them—some for rather lengthy periods—and the minute I saw the 43, I knew she represented a major change in direction for the company. She’d turned the whole convertible concept on its ear because she was focused first on cruising and then on fishing. Oh yes, the 43 had that unmistakable Riviera convertible look, but her hull was dark gray, not a color you’d likely see on a battlewagon. 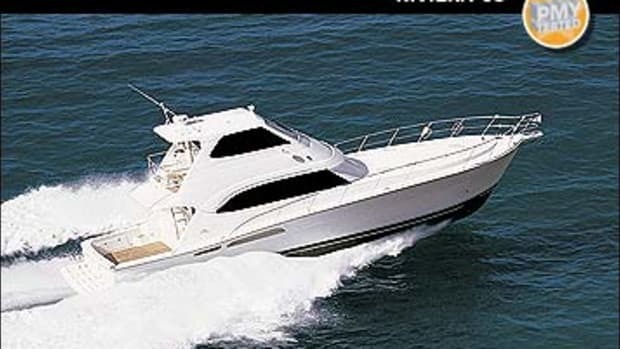 She also had a four-foot-deep swim platform that would make hauling a billfish through the starboard transom door a bit of a chore. More telling was her cockpit, at the aft end of which was a module containing a barbecue and sink, with stowage below, not a baitwell/prep station (although it is available). Yes, there was a teak sole, but it was optional, and there were 4&apos;4"-long fishboxes port and starboard, but their gasketed hatches and lift-out liners meant they’d work well as dunnage boxes. (More stowage is available in 4&apos;5" long side compartments and inside.) And finally, at the forward port end of the cockpit was that fishiest of features, mezzanine seating, from which you could watch baits. But considering that it was shaded, cushy, had a stereo remote, was flanked by stereo speakers, and the saloon window forward of it could flip open, the seat was just as well suited to lounging. 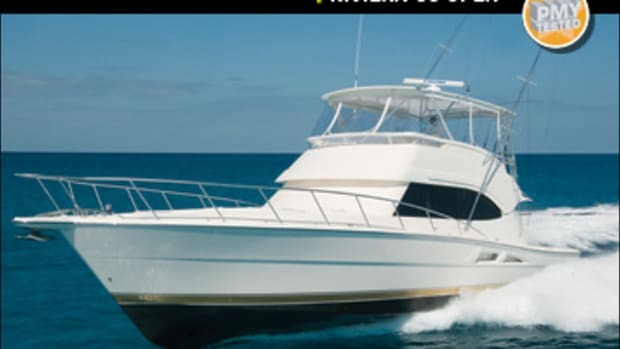 To sum it up: Riviera offers a host of options for the 43 that allow you to seriously fish it, but absent them, you have a very comfortable cruising boat. Take the saloon. It’s one step up from the cockpit and finished in leather and gloss cherry. With the galley forward and surrounded by glass, the main deck is all about entertaining and comfort. A starboard table extends to 4&apos;7", and two halves of the port-side settee split and slide over to provide two more seats for the eight-person dining table. 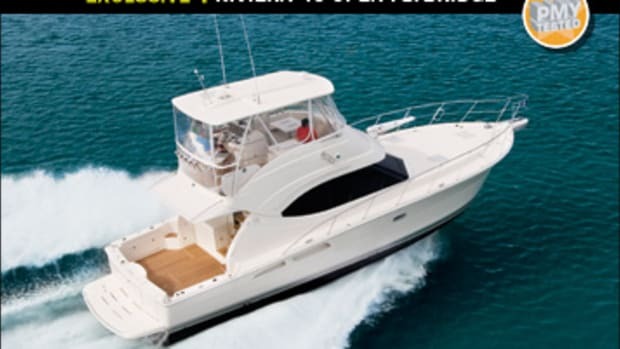 Each has stowage beneath, and there’s an overhead, flip-down compartment obviously derived from a rod-stowage compartment above and to starboard but with sea rails so it can hold things like bedding and duffel bags. Another stowage area is fully forward and to starboard, where the optional lower station goes, and yet another is beneath the saloon sole where conventional inboard engines would normally be. 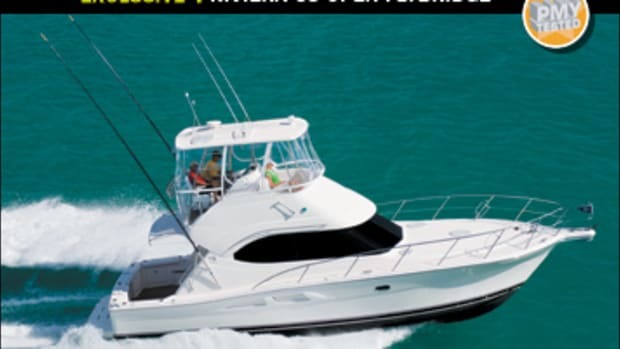 The bridge is, if anything, even less focused on sportfishing. Staggered helm chairs make it pretty difficult for a captain to face aft and watch the cockpit. But for cruisers, this space is pretty close to perfect. Sightlines are great all around, and there’s plenty of seating, a dining table, and to port, a sink and fridge. Although this is one of Riviera’s open-bridge models, an optional soft enclosure can make it sufficiently weather-tight so that you can easily heat and air condition it. On the lower deck there’s extra space because the IPS engines are so far aft. How it’s been utilized can only be described as unique. 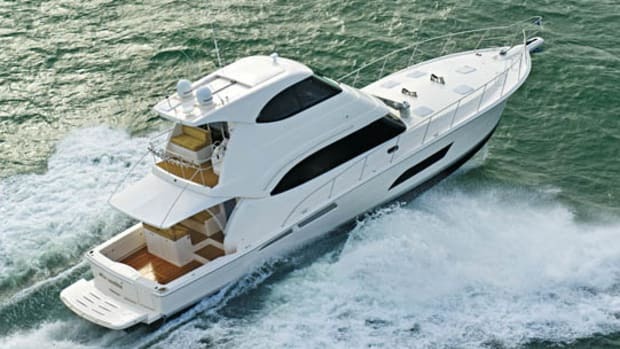 Despite the presence of a full-beam midcabin, Riviera designates the V-berth as the master. 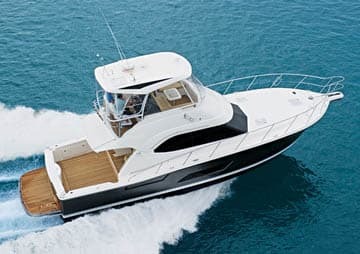 The midcabin enjoys more floor space plus, like the forward cabin, it has a queen-size bed (but aligned athwartship). However, it does not have en suite facilities; they’re just outside, in the lobby so that they can also function as the day head. What’s really different is that this stateroom has a second bed along the starboard side, which could accommodate a child who doesn’t want to sleep with siblings or just an unattached adult who doesn’t demand privacy. Either way this berth brings the 43’s sleeping capacity to five, although the Riviera Web site claims it to be six, apparently considering that second berth to be a double. That Web site also features a lot of pictures of an attractive, casually attired couple lounging about and dining in various places on the 43. There are shots of the boat at anchor, underway, and towing an inflatable. There’s not one of the boat being fished, even casually, so the message is pretty clear: this is primarily a cruising boat, and that marks her as different from her open-bridge sisterships and representative of a new course for Riviera, a course I suspect will appeal to a much wider audience. Oh, by the way, did I mention the 43 is powered by IPS pod drives? 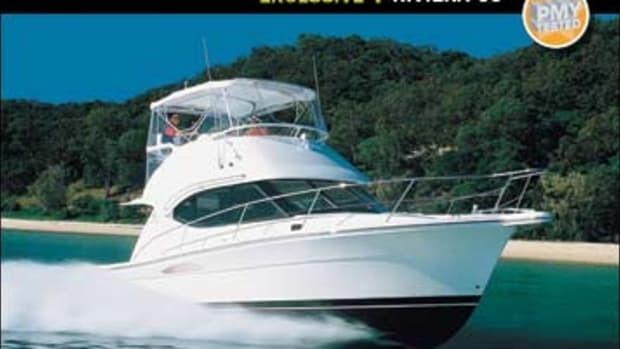 Riviera Yachts (772) 403-1060. www.riviera.com.au.